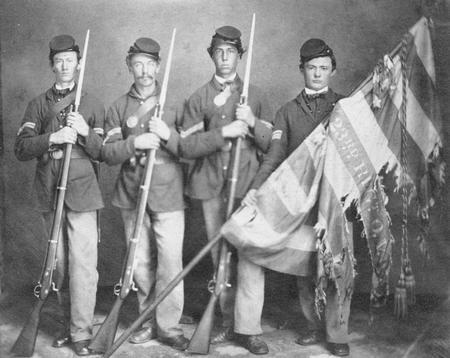 Difference between revisions of "American Civil War"
| caption = Color guard of the 23rd Ohio Volunteer Infantry with the national colors of their regiment, ca. 1863-1865. The regiment, composed of soldiers from Ohio, mustered in for Civil War service with the Union Army on June 11, 1861 at Camp Chase, Franklin County, Ohio. They mustered out on July 26, 1865 at Cumberland, Maryland. Throughout the 1850s, tensions between the North and the South escalated with violent confrontations. This was especially evident in "Bleeding Kansas." Some Northerners became convinced that Southerners unfairly dominated the legal system in the court case of ''Dred Scott v. Sandford'' (1856), which held that slaves were property and not citizens. John Brown's raid on Harper's Ferry in 1859 raised tensions further, as Brown hoped to seize the federal arsenal at Harper's Ferry in what is now West Virginia to arm the slaves in the South. The raid failed, and Brown was executed.